After more than 2 years of meticulous planning and dedicated hard-work, the eagerly awaited and much hyped ‘BaahuBali – The beginning’ has finally made its way to cinema halls all across the country. Given all the hype and the hoopla that has surrounded this film, it’s not surprising to see hundreds of eager film buffs line up in droves outside cinema halls to catch the first glimpse of this magnum opus. The films’ trailer, released some months before had already set the platform by gathering millions of likes and generated tremendous interest among viewers. In the first week itself, this movie is smashing all regional and national box office records. And if you just can’t get enough of it and want more, then there’s good news. Like the Cinema title suggests, this is just the beginning. There is a second installment of this movie due in 2016. And what else after that? God only knows!! Not everyone though, is happy with the film’s release. If newspaper reports are to be believed, this film has caused a great deal of concern to producers of other regional films mainly down south who complain that people have simply lost interest in their projects. But given the huge interest this film has generated, this was inevitable. Newspaper and Popular film websites also state that many south film producers have developed cold feet and have decided not to release their movie in and around ‘BaahuBali’ simply because they are aware that once this cinema hits the big screen, like small boats crushed under the wake of a giant ocean liner, their cinemas will be washed away. In Karnataka, “Baahubali” has already overshadowed movies of leading Kannada superstars such as Sudeep and Shiva Raj Kumar in the first week of it’s release itself causing no end of strife to the films’ producers. In Tamil Nadu, this movie has gained more viewership than ‘Paapanaasanam’ (the Tamil remake of the Malayalam movie ‘Drishyam’) which stars none other than Ulaganayagan (Universal Hero) Kamal Hassan: making it the first non-Tamil dubbed movie to succeed to such a big extent at the Kollywood box office. As an avid Indian cinema fan and a Tollywood film buff, I too am hugely excited and eagerly waiting to see it. Given all the frenzy this movie has generated, I know I will have to wait for some time to catch a glimpse in cinema halls; maybe after all the initial euphoria has come down. But I am sure the wait will be worth it. After years of watching countless foreign movies with superb jaw dropping visual effects, this movie is a sight for my sore eyes. Being a Telugu by birth, I am all the more proud that this film happens to be a Telugu Cinema. This film will silence critics who claim that Indian film makers can produce only emotional tear jerkers, mushy love stories and family dramas. What’s even more heartening is the fact that this film has employed a large portion of local and national talent to create the VFX and special effects using computer graphics, instead of relying heavily on foreign talent and technology and ‘outsourcing’ the work. It’s true that some of the work was outsourced to foreign studios, but that was simply due to the fact that most of the the local studios involved were already neck deep in work. The entire movie was made on a budget of Two Hundred and Fifty Crore rupees (Forty Million US Dollars) which makes it the most expensive movie made in India yet. But it should be noted here that Hollywood movies produce similar effects at four times the price of this movie. 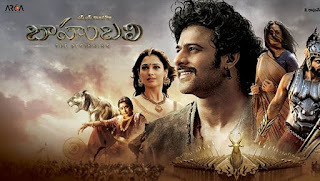 The entire creative team behind the making of this film starting from SS Rajamouli himself along with Firefly Studios, Makuta VFX and others deserve a pat on the back for producing stunning visual effects. I sincerely hope that this movie encourages Indian film producers to break barriers and leave no stone unturned to produce movies of the highest quality and visual appeal. We are already known the world over to produce movies with good music and emotional sentiments. Now add some VFX and technological punch to them and our films will slowly and surely rule the world.